California and Nevada years ago. I am not tech savvy. A little confused by your post, but if you want scanned versions of the “classic” USGS 7.5 minute quads, Garmin Birdseye Topo is probably your best bet. It costs $30 for unlimited downloads for a year, but you can continue using what you have downloaded even if you don’t renew. The USGS started winding down their topo map program in 1990 and by 2000 they completely stopped updating these maps due to the labor-intensive and expensive process of gathering data in the field. As a mapmaker, I’m a big fan of these maps myself but others may not be so happy because some of them haven’t been updated for 30 or 40 years. I offer some very high quality scans of the final versions of these maps for the Southern New Jersey area here: https://www.gpsfiledepot.com/maps/view/790/ It’s time consuming to create these however, so I really think Birdseye is your best bet. Another issue is that Garmin severely limits the size of scanned maps that you create yourself, but Birdseye doesn’t have that limitation. I don’t know of any easy way to connect a Garmin handheld to a cell phone, there might be some hack that would allow it to be done with a USB cable but I don’t know why you would want to do this in the first place. You lost me with the part about Garmin not being able to zoom in. The USGS maps are actually very low resolution compared to what a GPS is capable of. So you can easily see all their available detail on a Garmin device. But if you prefer using your phone but don’t think the internal GPS is accurate enough then you should get a bluetooth GPS receiver. Several companies make these in the range of $80 to $100 typically. Garmin makes a device called the GLO for example. A bluetooth GPS can connect wirelessly to your phone and send position data that’s more accurate than the internal chip. 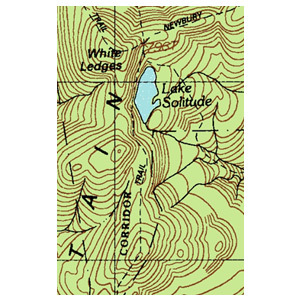 I download and convert USGS topo maps into "Garmin Custom Maps" all the time. It is something of an arduous process I developed, but it could be simplified a bit if you don't care about shading. I use a similar process for the satellite imagery included with the topo map, so I have both a topo and a satellite image. I'm not sure what Boyd means by "low resolution" - I'm attaching an image of some of what I do as an example - that is a tiny part of Big Bend National park. The entire topo map for that 7.5 degree quad is about 12.000x13,500 pixels. You can discern cars and buildings in the satellite image. 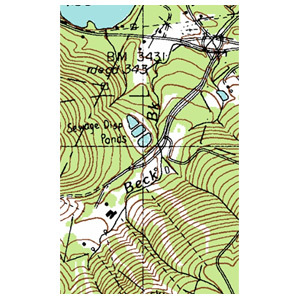 If you would like to point me to a specific topo map I'd be happy to do a really quick conversion of it into a Garmin Custom Map and you can see how it would look on your device. I'm not sure what Boyd means by "low resolution"
It's just simple math. USGS topos have a scale of 1:24000, I am making topo maps at a scale of 1:3000, which is 8x higher resolution. Here's a comparison showing the exact same area, with my map at the top. Notice how the USGS buildings are just square blocks that are bigger than the real ones. My buildings were hand-traced from aerial imagery. This is a flat area so no elevation contours appear on the USGS map. I used 3 meter LIDAR DEM to create high resolution contour lines (1 meter LIDAR is now available too). Also notice how fat the unpaved roads. The line weights on my map are very close to the actual width of an upaved road. The higher resolution on my map also allows the inclusion of property lines. I am also using forest shading and wetland data with native scale around 1:12000, which is twice as accurate as a USGS 24k maps. Like I said, I really admire the craftsmanship that went into the USGS topo's. But modern devices are capable of using much more accurate data. Wow - your procedure for making maps is very complicated! The screenshots look very nice though. Like most things, better tools make the job easier. I invested in a copy of GlobalMapper many years ago when the price was still reasonable. Have not updated it for many years, it has gotten very expensive since a big company purchased the software. But Globalmapper will directly open the geoPDF files from the USGS and you can re-project them as desired with a couple mouse clicks. Another mouse click will remove the map "collar". Personally, I really dislike hill shading on a USGS map, but if I wanted it then it's very simple to download DEM at any resolution from the USGS 3DEP website. Again, just a few mouse clicks will apply the shading to the map and you can tweak lots of rendering parameters in the preferences. So all of that is very straightforward. Where I spend my time is color-correcting the quads to match each other. There's a huge color variation in the different quads, some of them are yellow where they should be green! I use photoshop to fix this, which involves a few extra steps. It is also tedious to match the edges of each quad to the adjacent ones. Again, because the accuracy is rather low by current standards, the maps don't overlap all that well. Takes some trial and error to get the best stacking arrangement. My process of extracting the data from the pdf results in something not quite as blurry as yours...but I get what you are saying about the colors. I have two maps adjacent to each other with VERY different color for the forested areas...very annoying. I can use imagemagick (and a fuzz factor) to try to pick out the colors and replace them with specific color - that helps a bit, but with the new topo maps I don't have to worry about that...they are much more consistent with respect to color. How to I make my image appear inline and not with the thumbnail? Just want to re-iterate to the original poster - if you let me know an area you are interested in, I'd be happy to make a quick map from a single topo quad for you. The tiles are already Spherical Mercator and MOBAC will write a Garmin Custom Map directly. But it seems your maps are out of date - the railroad is no more! LOL, accurate railroad data is pretty hard to come by. The state has a terrific road database, accurate within +/- one foot, but it's only paved roads. Actually, I think the railroad in that little town is in a state of flux. They have been rebuilding crossings in that area over the past couple years and rumor is they are going to start using it again to transport sand/gravel from the nearby pits by rail. Thanks for the US Topo mapsource. Last time I tried to figure this out I got frustrated and gave up! The old USGS wms links all stopped working a few years ago. It's a good resource, but most people I know hate it. It's a sorry excuse for the level of detail found in the classic topo maps. And USGS admits this, blaming it on lack of budget. Yes, that does look good. My screenshot of the USGS map wasn't that great. I created that map at level 16 (1:6000 scale) and my own map is level 17. For that image, I just used photoshop to enlarge the USGS image by 200% so it would be the same size as mine. My source files are the full resolution of the USGS source images (3 meters/pixel IIRC). But there is compression in the final map, just to keep the size manageable. The USGS topo on my site https://boydsmaps.com/1999-in-the-pines/ covers 5300 square miles and is 4gb. Since file size is a squared function, if I went up one click to level 17 it would result in a 16gb file and I thought that was too big. Again, back OT for 102stan - I would seriously consider purchasing Garmin's Birdseye topo. We map nerds can debate all the technical issues, but for $30 you get unlimited downloads of 24k USGS maps for the whole county, plus coverage of Canada at 50k (IIRC). And since you are not technically inclined, that $30 also entitles you to "hand holding" from Garmin customer support. I had a look at the original PDF file from the USGS historic topo map archive. Globalmapper reads this at two meters per pixel. This is a Globalmapper screenshot at that resolution. So perhaps there is a better way to convert these maps? I did not pursue it in the past, because my maps are already one zoom level higher with less compression than the other USGS topo's I've seen on the web (there's a comparison on my website). Thank you BOYD I am not sure if I am responding in the proper heading.What I am after is the zoom of 24k with the ease of installing.I had read somewhere that Gamins viewing Quality was poor.I know I was disappointed with gamins California and Oregon topo SD card , I had expected USGS 7.5 Quality ,not even close.As for the cell phone I was thinking two things A larger screen with clarity ,the other I was under the impression that the Garmin 64 was unable to run USGS topo which I like.I am retired but like to explore the wood and desert and am new to today's technology. So what you are saying is that if I buy the Birdseye that I can get USGS topo with 24k zoom,is that correct and thank you to the members for there help. I have never purchased the Birdseye topo myself so I don't have personal experience regarding the quality. But they are the "real" USGS 7.5 minute quads. Garmin's "24k topo" products such as your California and Oregon cards are something completely different. If you look at the Birdseye Topo link I posted at the beginning of the thread, they have some screenshots. Finally had a minute to look at this. Thanks for posting, it's a good template for tiled maps in MOBAC, my previous experience has been with WMS map sources. BTW, your code is missing the closing </customMapSource> at the end. In playing around, I noticed that you can also access the ArcGIS US Topo maps in Mobile Atlas Creator. Apparently they bought the old National Geographic TOPO! maps that used to be sold on disk. 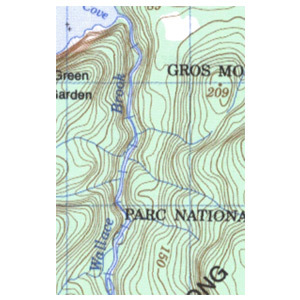 So here is a source for seamless scans of USGS 1:24000 topo maps with hillshading. They only work up to zoom level 15 and aren't going to meet MojaveMan's high standards, but they aren't bad and they're free. Here's a custom mapsource for Mobile Atlas Creator. Copy the code below, paste it into a text editor, save the file as TOPO.xml and place it into the mapsources folder in Mobile Atlas Creator. It can then be used to export Garmin Custom maps.